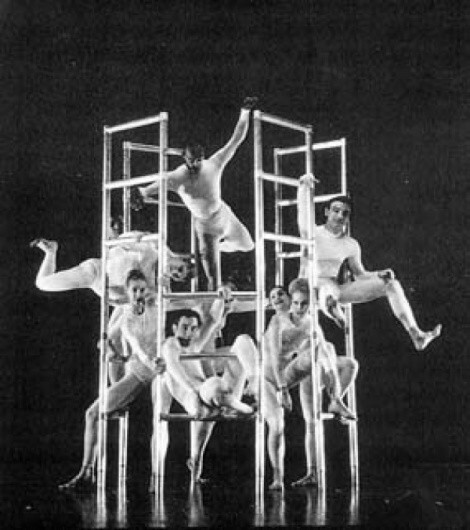 Dance | Babel On: Forty years after its creation, Tower still resonates with significance. Imagine a world in which a civilization celebrates its grand achievements by constructing a majestic tower. This tower is meant to represent the beauty of the world in total, a nod to the brilliance of global humanity. Now imagine that tower falling, crashing down from the sky with such force that the Earth itself shifts and quakes. Admittedly there is no way that choreographer Alwin Nikolais could have foreseen an event such as 9/11, a tragedy that is permanently embossed upon our collective psyche. But still, there is something eerily familiar about his 1965 work Tower. With such a powerful image central to the composition, there is no doubt that that a calamitous day in American history will be jarringly evoked as Ririe-Woodbury Dance Company (RWDC) reconstructs this classic piece of dance theatre. Throughout the work, each dancer is speaking, ranting and babbling. For the most part, those various utterances remain incoherent, except for the periodic statement, question or command that breaks through all the communal noise, piercing the audience’s individual thought processes. Nikolais was making a statement that we all kind of live our lives alone; we may talk to our neighbors, we may casually engage acquaintances, but half of the time, we don’t even listen to what they say. Nor do we often recognize what we are doing and what profound effect it may have on everything around us. But like most cherished achievements within a society, imminent demise is inherently built in. In this piece, the dancers quickly realize that what they have erected is not a thing of beauty, but rather a total monstrosity. It is only then that the eyesore finally implodes upon itself and comes tumbling humbly back down to earth. Ultimately Nikolais was exploring the loose underpinnings of a modern society that was rapidly abandoning its mores. Originally, the piece included flags that represented a Big Brother looming over a newborn burgeoning global society—acronyms such as IBM and CIA, mega-organizations that were beginning to take control of the world. When it was re-staged back in the 1980s, the acronym flags were tossed out in favor of flags bearing more symbolic messages promoting black power, gay rights, peace, etc. So certainly, Nikolais couldn’t have been consciously prophetic; he never claimed to be a choreographing Nostradamus. But what he did do was to create a work perched upon the cusp of all things modern. The fact that a 40-year-old piece of art can ring so contemporarily true is a testament to one man’s creative genius—even when it harkens to something so bone chillingly dark as those two collapsing towers.